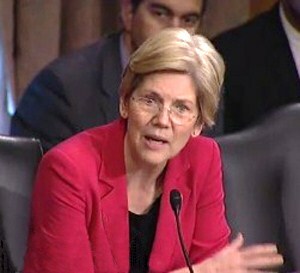 Senator Warren: I just want to take a look at the Independent Foreclosure Review Payment Agreement details. I think you’ve probably all seen this one page agreement that lists all of the things that the banks did wrong and then boxes for how many people fall into each category and how much money they’re going to be paid. Is that right? You’ve all seen this? [Panel indicates they have seen it.] And this was put out – who put this out? I think this is put out by the OCC and Federal Reserve. Is that right? As part of the settlement details. So I just want to ask you about this. It has some pretty amazing categories here. The first category is about service members who were protected by Federal law whose homes were unlawfully foreclosed. It’s got people who were current on their payments whose homes were foreclosed. It’s got people who were performing all of the requirements under a modification who lost their homes to foreclosure. And it tells how many people fall into each category and how much money the people in that category will receive. And, it ultimately resolves what will happen to 3,949,896 families. So the question I have is having resolved this nearly 4 million families, who put the people, the families, into each of these boxes. Is that what your firms did. Mr. Ryan? Senator Warren: So who put them in. Senator Warren: So let me understand this. You ran the independent reviews, right. That’s what you got paid to do. And yet, I presume, the only one left is the banks must have put them in these boxes and you made no independent review of their going into these boxes. You were not asked to do that? Mr. Alt. Alt: No Senator, we were not asked to do that. Flanagan: No we were not. Ryan: We were not Senator. Senator Warren: So that leaves us with the banks that broke the law were then the banks that decided how many people lost their homes because of their lawbreaking. And, as a result, how many people would collect money in each of these categories. Is that right Mr. Alt? Senator Warren: So far as you know, there’s no independent review of the banks’ analysis…you looked at 100,000 cases and the banks have now put 4 million people into categories and resolved finally how much they will get from this review by the OCC and the Federal Reserve. A call to the Office of the Comptroller of the Currency confirmed that the OCC and the Federal Reserve allowed the banks to determine who had been harmed and in what manner. The OCC said it “spot checked” the work by the banks. When asked how the results could be legitimate if only 100,000 foreclosure files out of 4 million had been reviewed for errors or fraud, not a large enough amount to be a statistically reliable sample, the OCC spokesperson said the injuries were only hypothetical and might have happened. It has been previously reported that, cumulatively, seven outside consultants hired by the banks received $2 billion in consultant fees. Senator Sherrod Brown asked the witnesses from Deloitte, Pricewaterhouse Coopers and Promontory to provide specifics on their fees. Only Flanagan from Pricewaterhouse Coopers answered the question. The firm was paid $175 million by Citigroup; $190 million by U.S. Bank; and $60 million by Suntrust Bank. That compares to the cash the three banks agreed to pay to foreclosure victims as follows: Citigroup will pay $306,574,179; U.S. Bank will pay $80,060,193; and Suntrust will pay potential victims $62,555,947. When the regulators originally fashioned the stipulation for the reviews, it was expected that the consultant fees would run $5 to 8 million. In the above example, Pricewaterhouse Coopers collected $425 million in fees from the three banks while illegally disposed families and other types of foreclosure victims will receive only $24 million more than that for their pain and suffering, or a total of $449 million. In class action lawsuits, lawyers are rarely allowed to collect more than one-third of what the plaintiffs receive. In this case, the consultants collected a sum equal to 95 percent of the cash going to the injured parties. The settlement was viewed as a windfall for the banks from the beginning because it only dealt with foreclosures on primary residences that were commenced or completed in a two-year timeframe, 2009 and 2010. Yesterday’s Senate hearing was titled Outsourcing Accountability: Examining the Role of Independent Consultants but it cast a dark shadow over banking regulators as well. Testifying on behalf of the regulators were Daniel P. Stipano, Deputy Chief Counsel, Office of the Comptroller of the Currency (OCC) and Richard M. Ashton, Deputy General Counsel, Board of Governors of the Federal Reserve System. Under questioning by Senator Reed, Stipano explained why the regulators had not conducted the foreclosure reviews themselves: “The problem with having the OCC do this work itself is it is just beyond the means of any Federal banking agency to do this,” said Stipano. “I mean, the size, the scale, the scope, the complexity… it’s not a question of bringing on some more examiners, we would probably have to triple or quadruple the size of our staff.” That answer offers yet another solid basis for breaking up the too-big-to-regulate banks. The OCC updated its announcement on February 28, 2013, noting that the number of settling banks now totaled 13 and the pot of restitution had grown to $9.3 billion, broken down as “$3.6 billion in cash payments and $5.7 billion in other assistance to borrowers such as loan modifications and forgiveness of deficiency judgments.” Settling banks include: Aurora, Bank of America, Citibank, Goldman Sachs, HSBC, JPMorgan Chase, MetLife Bank, Morgan Stanley, PNC, Sovereign, SunTrust, U.S. Bank, and Wells Fargo. According to the OCC, payments will range from $300 to $125,000. The majority of recipients are expected to receive no more than $1,000. Checks will be sent in several waves, with 1.4 million checks being mailed today. Final checks are expected to be mailed by mid July of this year. The Federal Reserve will publish separate information shortly for mortgages serviced by Morgan Stanley and Goldman Sachs. Four mortgage servicers did not settle and the foreclosure reviews are continuing. Those institutions are: GMAC, Financial Freedom, Everbank/EverHome Mortgage Company and OneWest Bank/IndyMac Mortgage Services.